You are probably here because, like most new parents, you have now realized that you are going to need, or already do need a cot or crib! But cots and cribs don’t fill themselves, and while picking out a cot can be a chore, picking out a mattress your little one is going to be playing and sleeping on, is quite another. 3. Let’s be honest now, not all of us have a Jolie-Pitt budget, so yes, price is factor also. 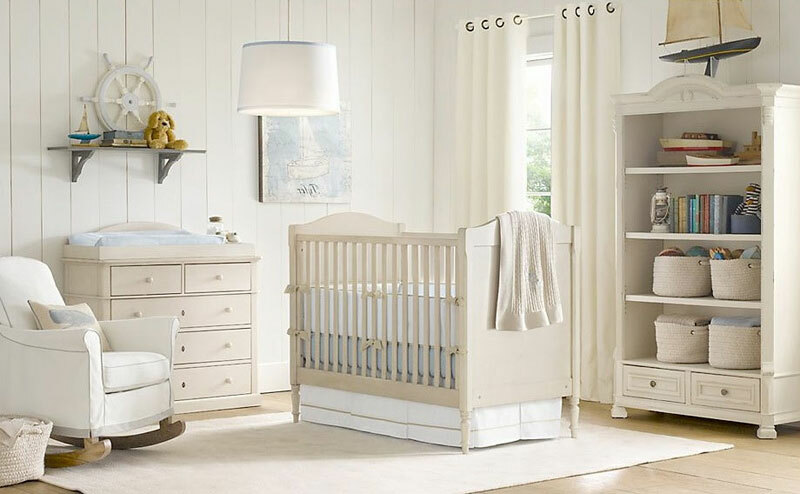 If you had a quick glance at the current baby mattresses on the market right now, you would already know that shopping for a crib mattress is well and truly overwhelming – there is literally hundreds of crib mattresses. So how are you supposed to know which is the right one for you and your baby? Well, we have narrowed down the selection from hundreds to 7. Once we put the research into it, it wasn’t really that hard to bring the list to 7 of the safest cot mattresses. FYI: Between all of us here at thebabybed, we have purchased 4 of the mattresses on the list between 10 children. We hope to help each and every one of you with this big decision, not only in your life but for the life of your beautiful little beings! It should make the decision on what crib mattress to buy a lot easier for you. The numero uno on the ‘mother-nation best baby mattress’ list is a Simmons baby mattress called the Simmons Kids Beautyrest Beginnings Sleepy Whispers Ultra Deluxe. Why is the Simmons Beautyrest the No.1 toddler mattress ranked by us? Because it is the best selling crib mattress (it can literally can go from in-stock to out-of-stock from online crib mattress retailers within a day), it is the safest crib mattress, it’s very popular and it’s also good value. 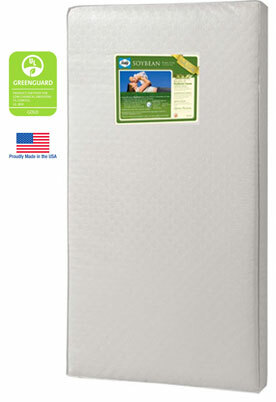 This Simmons kids crib mattress is not only set apart by a coil spring mattress but is also is certified by both GreenGuard Gold and Certipur. While the mattress is flame resistant and certified by Federal standards, the fire redundant covering (which covers the mattress under the water-proof vinyl cover) is made from 100% hypoallergenic linen. What’s better is that this Simmons crib mattress is dual sided, with a firm version for infants – firm enough to avoid accidents like crib death. The other side is soft enough for a toddler, and with its coil as opposed to foam base, sagging isn’t even an option! Leading the way, the Simmons is the best baby mattress for 2015, 2016 and 2017. Basically, it has all the best features in one crib mattress. Second on our list of the safest baby mattresses for your toddler is the Moonlight Slumber Little Dreamer crib mattress. This baby, crib and toddler mattress, which is one of Moonlight Slumber’s more economical crib mattress/bargain mattresses, is yet another dual sided, foam mattress. Related: To read Linda’s full product review and more details, read here. But this particular mattress strives to set itself clearly apart from its counterparts on this list with Certipur certifications to clear any chemical usage and even stands proudly as being PVC and vinyl free. This makes it not only a non-smelly mattress, but a healthy one. 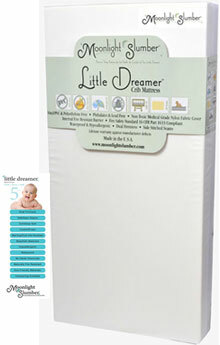 Flammability issues are subject to federal regulations as with all other crib mattresses on this list so fire safety is also ensured with the Moonlight Little Dreamer crib mattress. Most of all, my time favorite feature of the Moonlight Little Dreamer is that the seam goes all the way around the middle instead of any of the corners. This is just so amazing when you are clearing up a nasty nappy change. The fact that this crib/toddler mattress is a foam mattress, its not only lightweight is also dual surfaced. Although not the #1 mattress on the list, the Moonlight Little Dreamer is a popular buy in 2017 as it remains one of the highly top rated crib mattress by hundreds of buyer verified Moonlight slumber reviews. Number 3 on the list is a Naturepedic mattress, which means right off the bat, I absolutely love it. Naturepedic is the best baby mattress brand when it comes to delivering the guarantee safety seal for non-toxic, 100% natural and organic toddler crib mattresses. The Naturepedic No Compromise Organic Cotton Classic Crib Mattress has ranked #1 on our ‘Best Organic Crib Mattress’ list. Generally priced on average above $200, it is at the higher end of the market when it comes to value. In comparison to the Simmons BeautyRest or the Moonlight Slumber Little Dreamer, it can be viewed as a ‘luxury’. However, remember this ‘luxury’ provides the following features in being top quality, organic, 100% natural and a non-toxic mattress. This particular crib mattress is made in the U.S. of A from 100% organic cotton and again, as discussed above, has two-stage dual firmness, which has that great benefit of having a firm infant side and a less firm toddler side. With both a waterproof surface AND waterproof seams, this means obliterating germs that much easier. 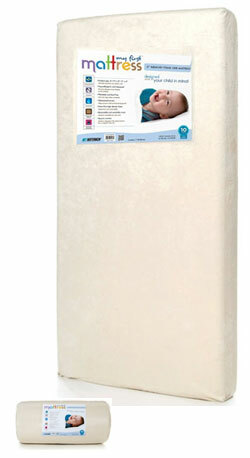 Number 4 on our list of recommended crib mattresses is the Sealy Soybean Foam-Core Mattress. While the Sealy SoyBean is a steal in terms of price it is the cheapest crib mattress on the list and is also known as one of the ‘budget crib mattress’ alternatives for parents on a budget. The Soybean Foam does however, lend a certain amount of additional firmness compared to normal foams, but is also reported to have been too firm in many cases. It’s main appeal at number 4, is that the Sealy Soybean Foam Core Baby Mattress is a popular choice for parents due to its price. However (from our experience and what we have found with a lot of other parents reviews on the Sealy Soybean and Sealy’s baby mattresses) is that spending a little more on some of Sealy’s other crib mattresses does pay off in terms of quality. The downfall with the Sealy Soybean baby mattress that has been reported by a few of my close friends is that they fell that it has a tendency to shrink and also another Mom mentioned that her’s sagged recently. Although to be honest, I’ve not heard much else parents are unhappy about with this one. To clarify things, the soybean core is made from soy bean oils from American farmers. All in all, my opinion is that it’s an affordable mattress made with quality craftsmanship in the USA and remains a popular choice and a better alternative for parents looking to buy a quality mattress for a good price, as opposed to just buying a cheap crib mattress such as the Safety 1st Heavenly Dreams Crib Mattress (which is a one that is the cheapest around, purchased by alot of parents but our opinion is that we just like to spend a little more, you can read more about the cheap Safety Heavenly Dreams Crib Mattress in our Safety 1st Heavenly Dreams Review). I know what you thinking, toothpaste? Well no, actually, there is a brand of kids mattresses called Colgate. As the newer version of the Colgate Eco Classica I, the Colgate Eco Classica III is one of the few toddler mattresses (the other being the Number 1 Simmons) that passes GreenGuard standard tests and furthermore is made of Certi-PUR-US certified ecologically friendlier foam. The Colgate Eco Classica crib mattress is dual sided and super lightweight for easy to lift up sheet changes, which is a huge plus in my book. It’s only major drawback (which really isn’t that bad but when you are comparing crib mattresses per se) – is it’s cut-throat price, ranging from around $200 (see below for current price) and upward. This may be viewed as a bit steep for your pockets for its list of features (considering that you can buy the best natural and organic crib mattress – the Naturepedic for only a couple of dollars more). 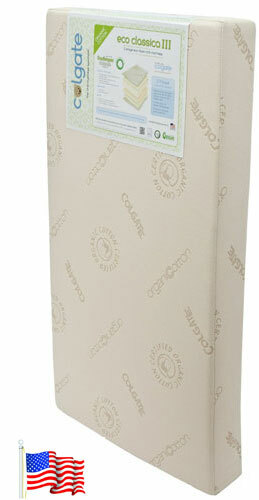 If you want to ensure you are buying an organic cotton crib mattress, this is the one for you and your child. Unlike the Lullaby Earth at No. 7 below, Number 6 on our list of best quality crib mattresses is a crib mattress made from memory foam, manufactured by My First Mattress. The My First Mattress crib mattress is a hypoallergenic, mite-proof, phthalate-free mattress which also meets all federal flammability standards. At around $100-$150, it’s quite a steal too, the crib mattress is primarily made of extra firm high density foam. It has the added benefit of being very soft, which is where it gets the ‘memory mattress’ name. The reason why I feel that way is because I believe that newborns, especially ones who have a tendency to turn over on their belly when they sleep, are in constant danger of suffocating themselves since they lack the ability to turn back over like toddlers or older children. The softer they get, I just get more scared. But in saying this, many many parents love this mattress and I can see why. It’s not bad at all, so don’t get the wrong impression at the My First Mattress Memory Foam is stuck at Number 6, it’s no indication at all. Although this is just our personal opinion on the My First crib mattress, we did read through many reviews and can understand why many parents like it and bought it as a crib mattress. Despite our concerns, it does remain a popular choice for a crib mattress. Lightweight and waterproof, manufactured with no harmful chemicals and has seamless edges. Finally, the last crib mattress on our list is the newest entry (which is Naturepedic’s more affordable option) the Lullaby Earth Super Lightweight Crib Mattress 2-stage. It’s made in the United States and is a non-toxic crib mattress with seamless edges similar to the Moonlight Slumber crib mattress. Being so new, we cannot personally vouch for it but one of my close friends just bought the Lullaby Earth crib mattress and I do believe it’s a great mattress. In saying this, my personal feel of the mattress is that it is lacking on the exterior finish which honestly feels a little unfinished in my opinion, however, I am just being a bit picky here (it’s honestly not a reason not to buy it at all). Judging by the reviews of the Lullaby Earth and the top score by online stores such as Amazon, this is a great buy none the less. 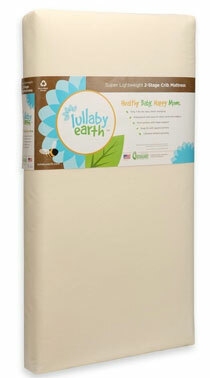 The Lullaby Earth crib mattress is marked at around the $200 price tag; this is a great new mattress for those with a slighter higher budget, or for those who really like to buy the newest product around. Okay, now down to business; baby, toddler and kids crib or cot mattress shopping and making your final decision on which crib mattress to buy for your baby or toddler ain’t no easy feat. One thing we are all well aware of is the importance of a safe crib mattress, in terms of a child’s growth, development, comfort, and safety. Quality is a must, so keep in mind that spending that little extra is important. While cheap baby mattresses appear all good and fine to begin with, in the long run, they crack and tear and are more often than not doused in chemicals your baby should not be within a yard of, let alone sleeping on it as a cot bed mattress. The right cot mattress, is also one that’s doesn’t bankrupt parents, a lot of times the sky high prices on an organic crib mattress in store (that’s why we recommend to buy a crib mattress online) can tempt you to either buy one that is second hand (which you should never do) or worse, to buy into what the sales person is saying without bothering to read through the mattress’ own specifications. Another easy mistake to make is going for a mattress that is too soft. All in all the number of aspects to factor in, are mind boggling, so that’s why it’s important to make a decision based on our top picks of the most popular and safest baby crib mattresses so you can decide for yourself which mattress is the right fit for your child and family. So, the above are seven of the top baby crib mattresses as decided by us, but also cross checked with many customer and buyer reviews of crib mattresses. Although it may seem simple outlining the 7 best crib mattresses, we have probably put in an additional 7 hours of work behind the scenes ensuring we give you the best advice we can when it comes to buying a quality crib mattress to the little one that you love the most. Going through endless crib mattress reviews and conflicting comments about what is the best crib mattress for your baby, this is enough to confuse even us pro’s, so we hope that our helpful little list of the best crib mattresses for your baby gives you that extra confidence. This list has been carefully selected by us, Heather, Emma and Linda at thebabybed.com based on our own experiences with our children. Some may look at us as being biased, but as we have already mentioned, we have over 10 children between 3 of us and we have had our fair share of highs and lows when it comes to ensuring you buy the best for the little ones. Linda McGill, founder and active contributor to thebabybed.com. My husband Dave and I have 4 cheeky and curious children. After my 3rd child, my husband and I decided it was time for me to retire as a registered nurse and be a full time stay at home mom. This site has now become a hobby of mine and I absolutely love it. Hi there! What do you all think about Nook brand mattresses? Thank you for all of your wonderful work! I am looking into the Moonlight Slumber Little Dreamer Dual Firmness All Foam Crib Mattress and was wondering about one piece of information. On Amazon, the description says that it is: “Treated with ultra fresh for antimicrobial protection”. What does that mean? Is it safe? Unfortunately, the first choice, Simmons mattress, is not available on Amazon for 4-5 weeks. Your very welcome Devora, thanks for your feedback. Just because the Moonlight is No.2 doesn’t mean it’s not great, many many parents rave about the Moonlight crib mattress. Great question – ‘Treated with ultra fresh for antimicrobial protection’ just means that the mattress has anti bacterial properties so ensure there is no bacterial growth on the crib mattress. Some people love it, some people don’t, it’s personal choice and we wouldn’t recommend a mattress that isn’t safe so don’t worry, Moonlight is one of the leading mattresses for babies. However, the only way to not go for a mattress with some sort of anti-bacterial protection is to go full natural such as the Naturepedic (#3). Hope this makes more sense. Thank you for your recommendations on crib mattresses. We just bought the Naturepedic. What are your thoughts on mattress pads between the mattress and sheet to add a little cushion and warmth? Or is it best to leave it with no cushion for our 5 month old? If mattress pads are okay to use, which kind would you recommend? I just bought a Bayletto crib for my daughter and wanted to know if you recommend the safety first heavenly dream mattress. Thank you for this great site and particularly for this article. I am wondering how you feel about the Secure Beginnings brand, which has a mesh-like sleep surface over a frame. The website states it is the safest option as baby can breath through it if she rolls over. I am pregnant with my first and am a chronic worrier, so am considering spending the extra $ on this option. However I plan for her to sleep in our room in a co-sleeper for the first few months, so maybe by the time she moves to her crib this may not be as important? Do you feel this mattress is safer?? Beneficial in any way? Or unnecessary? Thank you in advance! Apologies for the extremely late reply, we have had a terrible time accessing the comments on our site, but all fixed now so I am not too late to help you out. Thanks for the nice comments by the way. Yes, the Secure Beginnings crib mattress is indeed a revolutionary product when it comes to crib mattresses. We haven’t included it on here as frankly, it’s not the average product that most parents can afford and we try to give our following affordable quality options. If you are a chronic worrier, then to make yourself feel at ease, it’s probably worth going ahead and getting one. It’s not unnecessary in any way, infact all crib mattress need to be more inlight with Secure Beginnings innovation. 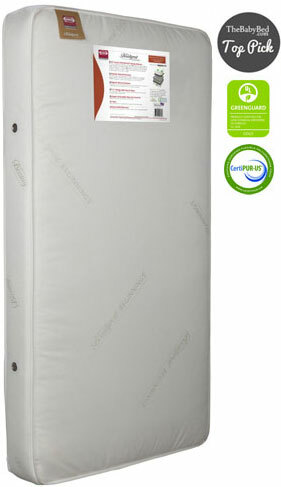 It is indeed an excellent product, and would have to be one of the safest crib mattresses out there. I do believe for sure that this mattress is beneficial in every way, not only for your baby’s breathability if they roll over but also for overheating purposes. I tend to have a worry of overheating/ensuring the crib mattress has the proper air flow to provide accurate/comfortable temperature. They’ve taken the whole manufacture of the mattress very seriously and Eco-friendly and non-toxic also which I like. Completely up to you, I personally do like the product and yes it is safer. I was wondering if you had any feedback on the DaVinci Brand with regards to crib mattresses? Also, with any of the Sealy or other Simmons ones? Hi Amy, yes indeed. I’ve noticed more talk around the DaVinci brand of mattresses (especially this one here, seems to have gained alot of momentum this year so good question), I think they are improving their quality so indeed, I might look into this with more interest to provide on here. I’ve traditionally looked at the DaVinci brand of crib mattresses as more of a cheaper option thus, great if your on a budget but when it comes to quality, I just feel their make isn’t up to par especially with the compared to the ones I’ve included above (and esp. in comparison to the Sealy or Simmons mattresses). They are ‘ok’ for the reasons they they are moving towards making baby mattresses that appeal to the health conscious parent (non-toxic, no adhesives, no lead, no phthalates and no toxic flame retardants – so that is all good) but I would think they should be included in more of a ‘good value’ category than rather a ‘quality crib mattress’ category, if you get me? I personally still opt for the Simmons or the Soybean (as above). I hope all this helps you and and wasn’t too long winded for you. I’ve tried to give you the most up to date information and from my point of view also. Thanks! I was leaning more towards the Simmons or Sealy, but then again wasn’t sure, for example, if all Simmons are created equal. We are trying to find the happy medium between good quality and good value, obviously leaning more towards quality over value though! I appreciate your thoughtful and detailed reply! Yes the #1 option above is breathable, it’s your best choice apart from organic mattresses as you mentioned. Hi, we have a lower budget for this mattress and I was wondering if you had any good recommendations for mattresses <$100. Thank you! 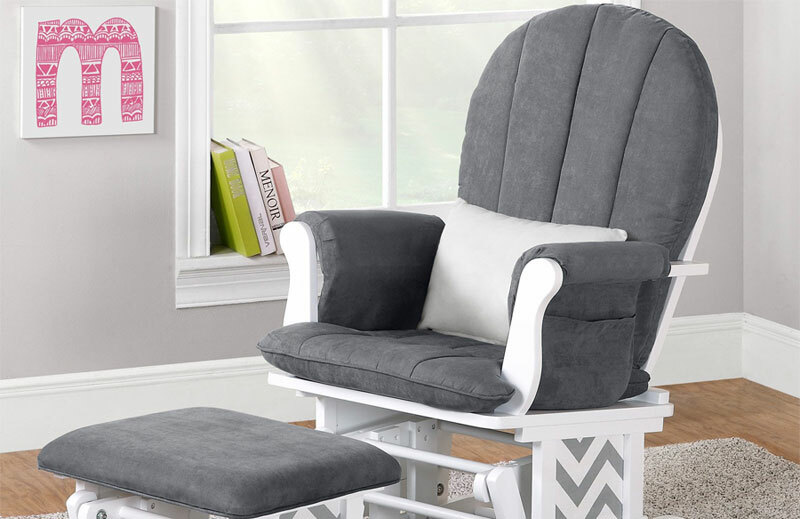 Sure no problems, well the Sealy is currently on sale (you can buy it just above $100 here) so I’d probably recommend that if you are happy to spend around the $100 mark. If not, this one is just under $100 here. Both of these are included on our best crib mattresses list above so that’s the good thing. I think crib mattresses around $100 should be your lowest budget. We have written an article about a cheaper crib mattress here, which yes you can buy, but from our opinion, we are not huge advocates of this one. Let us know what you decide and would love to hear how you go with a mattress under $100.